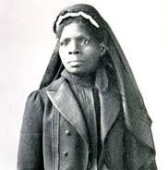 In spite of her birth as a slave, Susie King Taylor managed to obtain an education and became a famous nurse and teacher in the Civil War era. As an early advocate for human rights, she learned to judge people not by color but by actions. In 1848, Susie King Taylor was born as Susan Ann Baker, the first of nine children. Her parents were slaves on the Grest plantation in Liberty County, Georgia. The Grests were childless and treated the Baker children with great kindness. This had a great influence on how Susie later viewed relationships between the races. When she was seven, the Grests allowed Susie and her brother to go to Savannah, Georgia, to live with their grandmother, a freed slave. At that time, it was illegal to educate black children, but their grandmother was determined to educate her grandchildren and sent them to a neighbor who conducted a secret school in her home. They and other students had to hide their books and go in and out of the house one by one to avoid suspicion. Later, Susie was instructed by a Mrs. Mary Beasley and then by a white playmate. All of this was done in secret. Her last teacher was the white son of her grandmother's landlord. He taught her until the Civil War started, and he was sent to war and she returned to live with her mother. In 1862, Susie's uncle escaped with his family and Susie to St. Simon's Island where they were liberated behind the Union lines. While there, the Union officers noted Susie's education, and she was asked to form a school for the many liberated slave children. She was the first African-American teacher for freed slaves, and taught the children as well as adults until the island was evacuated in October 1862. While at St. Simon's, Susie met and married Edward King, a black army sergeant who was with the 1st South Carolina Infantry Volunteers that later was called the 33rd Regiment, U.S. Colored Troops. She became a part of the regiment and was given the job as laundress but, because of her education and skills, soon was given many more responsibilities. She traveled with the regiment and in 1863, began nursing the sick and wounded. She used a combination of traditional and folk remedies that she had been taught. After caring for patients with smallpox, she maintained that sassafras tea kept her healthy. Susie often went to the hospital for African-American soldiers in Beaumont, South Carolina. While there, she met and worked with Clara Barton, the Civil War nurse who later founded the American Red Cross. In her memoirs, Susie would say she was grateful that her efforts were appreciated. For four years and three months, she served without pay of any kind. When the war was over, Susie and her husband, Edward, moved back to Savannah, Georgia, where she opened a school for the freed slave children. In September 1866, Edward died suddenly while she was pregnant with their first child. Following this, Susie moved back to Liberty County for a while and then returned to Savannah where she supported herself by teaching. When free schools were established in the 1870s, Susie lost her income from tuition and was forced to take a job as a domestic servant. When her employers moved to Boston, she went with them and lived there for the rest of her life. In 1879, she married Russell Taylor. Even though Susie no longer worked as a nurse, she still loved nursing. She served the war veterans by joining the Women's Relief Corps, eventually becoming president and working for them the rest of her life. Despite all her work both before and after the war, Susie was not given a military pension because of a technicality. The commanding officer of the First South Carolina Volunteers sent her a letter that said he regretted this because there was no one more deserving than her. In 1902, Susie published her memoirs, becoming the first African-American nurse to write about her wartime experiences. In her memoirs, she expressed her disappointment that there were still injustices toward black people after the war. She stated that the South would be the only place to live if they were only allowed justice. Susie King Taylor left a legacy of hard work and devotion to duty, no matter what the circumstances. She did not judge people by their color but by their actions and expected others to do the same. She deserves to be included in the prestigious list of famous nurses because of the impact she had on so many lives.